Celkon, the Indian manufacturer who got famous with their ads featuring Virat Kohli, have launched the Celkon A119Q Signature HD phablet. 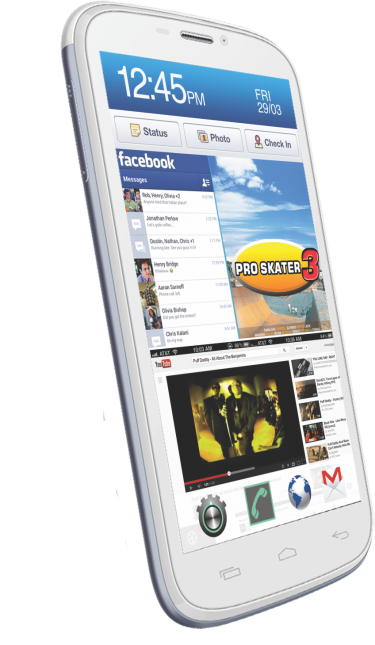 This phablet comes with Android 4.2 and a quad core processor, and is priced at 12,499 INR, which is 1000 INR lower than their previous model which had a dual core processor, which was priced at 13,499 INR. This phone will have many competitors in the Indian market, like the Karbonn S2 Titanium, Karbonn Titanium S5, Xolo Q700 among others. Talking about full specs of the phone, it has a quad core processor clocked at 1.2GHz which comes from Mediatek in the name of MT6589. This is a very popular processor and is a superb performer at the same time. The device has an impressive 1GB of RAM, which should be sufficient for even heavy multitaskers. The A119Q Signature HD comes with a 5 inch touch screen with an HD resolution of 1280×720 pixels, which again is quite good for a budget phone, your multimedia experience is bound to be enriching at this resolution. One of the best things about the device is the presence of Android 4.2.1 which is really good as some manufacturers are still stuck on 4.o ICS. There is a paltry 4GB of internal storage – which can be expanded to 32GB via microSD card. Manufacturers should really consider adding at least 8GB of in built storage as most buyers have to use a microSD with the 4GB storage. To speak of the cameras the phone again impresses with a 12 megapixel rear shooter and a 3 megapixel front shooter for video calling. This is quite good as compared to other competitors as not many offer 12 megapixel cameras. Regarding the connectivity features in the A119Q Signature HD, the phone is loaded with WiFi, Bluetooth, 3G, GPRS and all this is powered by a 2100mAh battery which is quite average. For most people though, it will get them through their day. According to Celkon, the battery will take you through 5-6 hours of talk time and up to 140 hours of standby, which seem quite ok to us, not bad. All in all, we would give this device a thumbs up, although you have quite a bit of choice when it comes to the budget quad core segment. Some big pluses about this device are – Android 4.2.1, a 12 megapixel camera, 3 megapixel front camera. These features are not commonly seen in this range of phones, and Celkon have done a good thing by including all these to this phone.